Glyceria maxima is a native to Europe and temperate Asia and has been intentionally introduced as livestock forage in seasonally inundated pastures, to temperate North America, New Zealand and Australia. In its native distribution in Europe, Glyceria maxima forms monocultures in wetlands that reduce plant species diversity. In areas of introduction, including North America and Australia, Glyceria maxima also forms monocultures and is now of conservation concern. Glyceria maxima is bisexual, perennial and rhizomatous grass (Morisawa, 2000; USDA, NRCS. 2005). These plants prefer wet and nutrient-rich soil range (Peeters, 2005). They are characterized as big in size, hairless, cespitous. Stems are unbranched and can erect to 100-250cm high (Morisawa, 2000; Peeters, 2005). Leaf sheaths have prominent midribs, visible transverse veins and are closed near the top (Morisawa, 2000). Leaf blades are flat but are a little bit rough when large (10-18mm) (Morisawa, 2000; Peeters, 2005). The leaf blades are shallowly grooved with prominent midribs (Morisawa, 2000). Leaves are short (3-6mm), cut and pointed in the middle (Peeters, 2005). Leaf margins have short, stiff hairs which are rough to the touch (Morisawa, 2000). Leaves are bright green but sometimes tinged with red (Lambert, 1947). Spikelets are usually 4-9 flowered, 6-12mm long and compressed on the side (Peeters, 2005). The inflorescence is a panicle which can be opened or contracted and are symmetrical (Morisawa, 2000). The inflorescence branches also have short, stiff hairs similar to those of the leaf margins (Morisawa, 2000). Glyceria maxima are terrestrial, perennial with a life span of 3-10 years. Glyceria produces vast numbers of dark brown seeds throughout summer and autumn (DIPWE, 2005). Seeds may be spread on water, in mud on machinery, on livestock but not so much by wind (DIPWE, 2005). Majority of the seeds are able to germinate immediately while others remain dormant for several years (DPI, 2005). Lambert (1947) reports that “spikelets carrying well-developed caryopses in basal florets are generally detached entire above the non-flowering glumes as soon as caryopses are ripe; fertile florets subsequently easily separate from sterile florets above them. However, majority of the completely sterile spikelets remain attached to the panicle until it dies down at the end of the year”. In its native range G. maxima is found growing from the lowlands up to high elevations in the mountain areas (Peeters, 2005). Lambert (1947) suggests that, “These plants are typically a freshwater species and found in the bank of slow-flowing rivers. 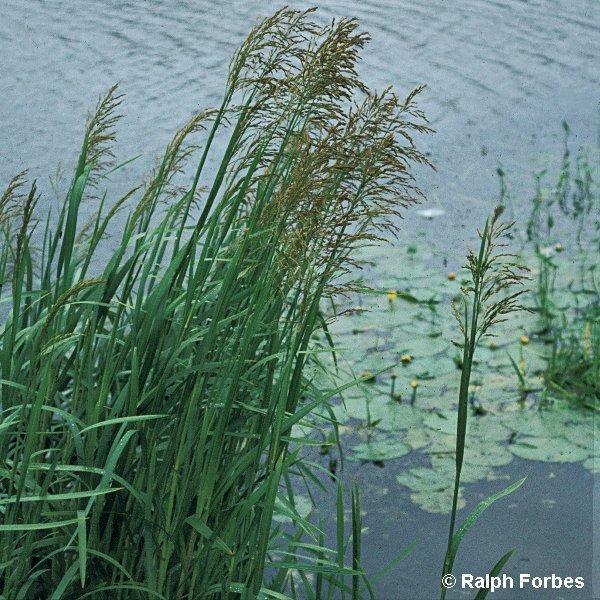 Exhibits a considerable vertical range in relation to water level, occur vigorously both as a reed swamp plant with roots and rhizomes immersed throughout the year. However, the presence of higher internal concentration of oxygen in the roots suggests for an immediate diphenylamine tests made on soil samples containing root fragments. Reaches best development both vegetatively and in production of flowering stems, in regions where summer water table is approximately at substrate level. When growing among other tall reed swamp species, they may produce excessively long vegetative stems. At the same time they are largely limited or excluded by the mechanical conditions of the habitat, where a diurnal tidal rise and fall of 20-30cm is combined with a loose, shifting substrate. These plants are found in fully exposed situations but are tolerant to slight shade”. Reproduction in dense stands of Glyceria maxima seems to be entirely by vegetative means rather than by seed; but no germination of grains yet observed in such stands (Lambert, 1947). The only well-established seedlings yet found in natural habitats are those which colonise wet bare mud and are often initiated by grains transported on feet of wading birds (Walker, 1946) as cited in (Lambert, 1947). Seeds may be spread on water, in mud on machinery, on livestock but not so much by wind (DIPWE, 2005). Recommended citation: Global Invasive Species Database (2019) Species profile: Glyceria maxima. Downloaded from http://www.iucngisd.org/gisd/species.php?sc=891 on 19-04-2019. Glyceria maxima can be a troublesome drainage weed and although palatable it has been implicated in the cyanide poisoning of livestock (NIWA, 2005). G. maxima has been intentionally introduced as livestock forage in seasonally inundated pastures, to temperate North America, New Zealand and Australia. 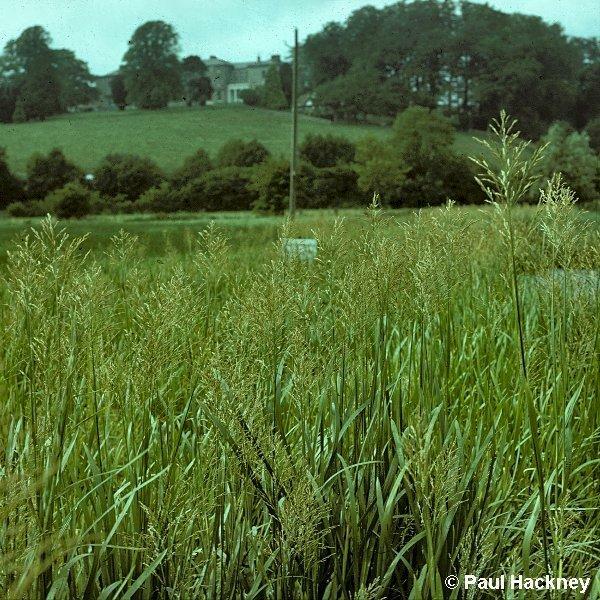 In its native distribution in Europe, G. maxima forms monocultures in wetlands that reduce plant species diversity. In areas of introduction, including North America and Australia, it also forms monocultures and is now of conservation concern. The large, dense monospecific stands are capable of crowding out native wetland vegetation (Clarke et al. 2004). Because it is both a poor food source and a poor nesting substrate for wetland wildlife, it has a significant potential to negatively affect wetland habitat dynamics (NIWA, 2005). G. maxima spreads aggressively in waterways and impedes water flow (Sainty and Jacobs 1994 in Clarke et al. 2004). It assimilates large amounts of nutrients and thrives in nutrient-enriched ecosystems (Sunblad and Robertson 1988 in Clarke et al. 2004). Clarke et al. (2004) undertook a study of three upland streams in Gippsland, Victoria, Australia to infer the impacts of G. maxima on macroinvertebrate abundance, morphospecies density, and morphospecies and functional feeding group (FFG) composition. The results of their study concluded that invasion by G. maxima appears to drive changes in macroinvertebrate morphospecies composition and FFG composition, reducing a diverse array of macroinvertebrates to a more uniform fauna. The authors describe G. maxima as an autogenic ecosystem engineer, with the ability to convert sections of fast-flowing aerobic streams into partially anaerobic swamps. They further observe that by generating a root-mat swamp with a high capacity to process nutrients, G. maxima may facilitate its own growth and spread, as well as that of secondary invaders. Chemical: Noble (2002) list Roundup Biactive or Weedmaster 360 as the permitted herbicide to use against G. maxima, the recommended technique is Foliar spray. The authors advise not to add surfactants. Clearance or drainage of growth area combined with dense revegetation with local native species is suggested for long-term results through stream shading. The authors warn of taking care Take extreme caution not to spread Glyceria seed through soil transport (e.g. on machinery). Informations on Glyceria maxima has been recorded for the following locations. Click on the name for additional informations. Summary: Available from: http://www.dpiwe.tas.gov.au/inter.nsf/WebPages/RPIO-4ZV7D8?open [Accessed 8 September 2005]. Lambert, J. M. 1947. Glyceria maxima/ (Hartm.) Holmb. The Journal of Ecology. 1947; 34(2): 310-344. Morisawa, T. L. 2000. Weed Alert: Glyceria maxima/ (C. Hartm.) Holmb. (Reed sweetgrass), July. Summary: Available from: http://conserveonline.org/docs/2001/05/Reed_Sweetgrass.doc [Accessed 8 September 2005]. Peeters, A. 2005. Grassland and Pasture Crops: Glyceria maxima/ (Hartm.) Holmberg. Summary: Available from: http://www.fao.org/ag/AGP/AGPC/doc/GBASE/data/pf000442.htm [Accessed 8 September 2005]. Shaw W.B. and R.B. Allen, 2003. Ecological impacts of sea couch and saltwater paspalum in Bay of Plenty estuaries DOC SCIENCE INTERNAL SERIES 113 New Zealand Department of Conservation. USDA-ARS, 2005. Glyceria maxima. National Genetic Resources Program. Germplasm Resources Information Network - (GRIN) [Online Database]. National Germplasm Resources Laboratory, Beltsville, Maryland. Summary: Available from: http://www.ars-grin.gov/cgi-bin/npgs/html/taxon.pl?17680 [Accessed 8 September 2005]. USDA-NRCS. 2005. The PLANTS Database, Version 3.5 (http://plants.usda.gov). Data compiled from various sources by Mark W. Skinner. National Plant Data Center, Baton Rouge, LA 70874-4490 USA. Summary: Available from: http://plants.usda.gov/cgi_bin/topics.cgi?earl=noxious.cgi [Accessed 8 September 2005]. Walker, C. 1946. Pao aquatica: Its uses and its dangers. New Zealand of Agriculture. 72, 43.